Google's next smartphones, the Google Pixel 3 and Pixel 3 XL have been leaked extensively, but as with every leak cycle, there are many different types of leaks that show up over time. Today, we are looking over the first official press render for the Google Pixel 3 and Pixel 3 XL. 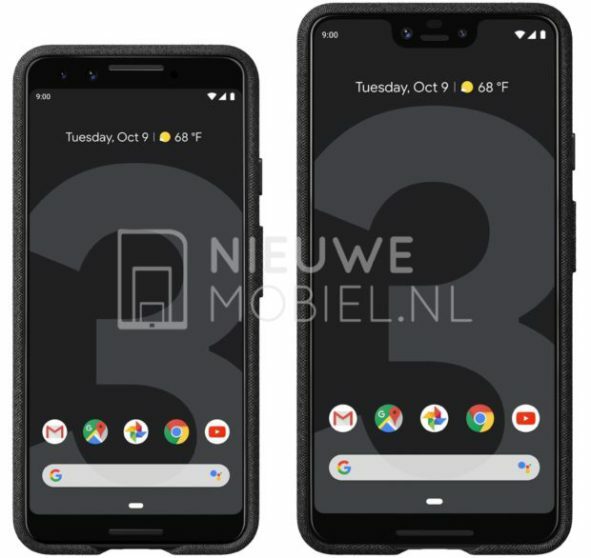 Folks at nieuwemobiel.nl, shows the pictures of the Google Pixel 3 and 3 XL exactly as we’ve seen them in the many leaks up to this point. There’s a smaller Pixel that basically looks like a smaller version of last year’s Pixel 2 XL, and the new, larger Pixel 3 XL that embraces a new notched display. 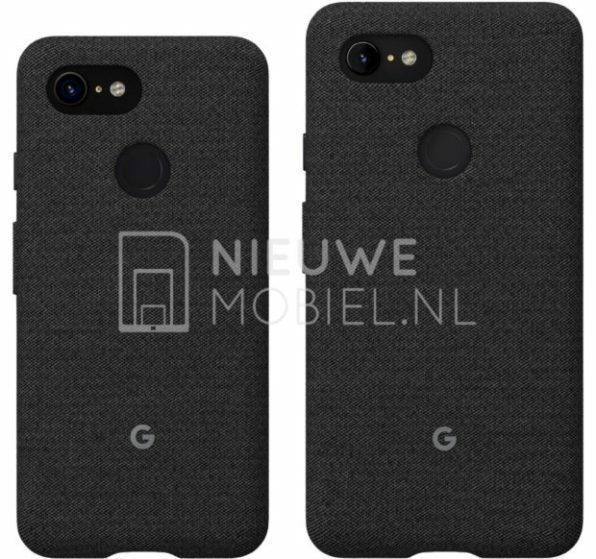 These renders also has the official fabric cases for Pixel 3 and Pixel 3 XL the same way Google did them for Pixel 2 and Pixel 2 XL. There is one interesting thing, the cutout at the bottom for the USB-C port is a bit narrower than last year’s version. In this leak, we also see one of the official wallpaper for Pixel 3 and Pixel 3 X but we are not sure, since the gray 3 has already shown up on the Pixel 3 teaser site and could somewhat easily be shopped on a render like this. Having a big gray 3 for a wallpaper is a little odd to us, but it very clearly tells potential customers one thing: This is a Pixel 3. They also seemingly will have the Assistant icon in in the Google Search bar per these renders. On the current Pixel 2 and 2 XL, that space is blank with no icon at all. We already know almost everything Google Pixel 3. Both will bring new features like wireless charging, improved cameras, the Snapdragon 845 system on a chip and an Adreno 630 GPU, 4GB of RAM. Both will launch with Android 9 Pie. The Pixel is known for having a great camera, and this one won't disappoint either. Both phones will have dual front-facing cameras, and the usual single rear shooter made great by Google’s machine learning. Obviously, a few aspects will differ between the two phones, including battery size and specific display specs. The Google Pixel 3 and 3 XL will launch at Google’s annual “Made by Google” event on October 9th in New York City. Google plans to hold a concurrent event in Paris as well. This is about as official as a leak can get. Any new thoughts on the Pixel 3? Let us know in the comments.